DIAL: Black racing dial with printed logo, reduced counters, tritium hour markers, Red hours, minutes and subsidiary seconds hand. CONDITION REPORT: Excellent overall condition. The dial is in mint condition with no major damage visible. The tritium at 8 o'clock has slightly thinned over time but otherwise a stunning dial and hands. The case has been slightly polished once, but edges are still sharp and the caseback logo is clearly visible. The bezel has faded over time to a blue/grey color and has some natural signs of wear but no major dents or chips. The bracelet is an original 1039/516 dated 3.67. There are some links missing so it is a bit short. 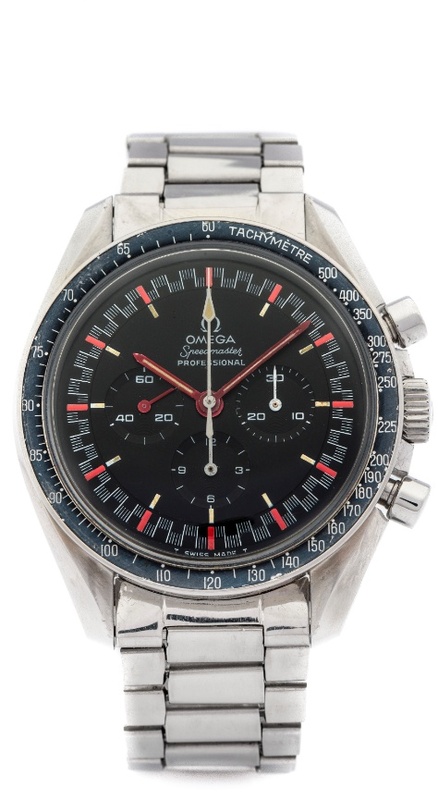 Notes: According to the Omega Museum, this watch was delivered to Switzerland in May 1968. This watch comes with a copy of the Moonwatch Only book in which it is featured on page 459. It comes as well with a letter from the author confirming its featuring in the book. It is also featured in The Ultimate Speedmaster Exhibition book on pages 60-61.